After ten months of preparation and filming, the remake of the 1977’s wuxia movie, Death Duel <三少爺的劍>, has concluded filming during the Mid-Autumn Festival. Mainland actor, Lin Gengxin (林更新), was chosen time to star as the legendary Third Master Chi, while Peter Ho (何潤東) stars as his rival, Yan Shisan. Gengxin felt extremely lucky to be involved in the movie, and started training with swords in April. “Derek and Tsui Hark are directors with martial arts backgrounds. They are experienced, and straightforward. I’m very lucky that I’m able to work with two grandmasters and be able to train under them. 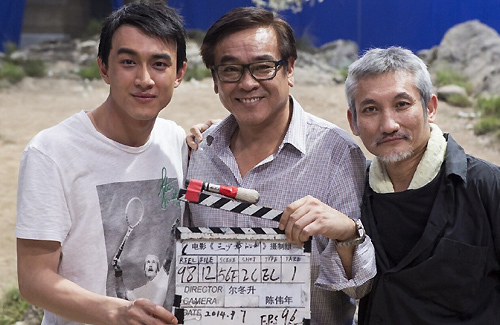 In the 140 days of filming, they’ve shared a lot of valuable experience and helped me realize my wuxia dream. Under their tutelage, I was given insight into the real world of a martial artist. Now that filming is completed, I’m ready to start my own wuxia journey. I’ll miss this, but I’m eager to see what’s next. I’ll continue to work hard and hope to see this movie soon,” Gengxin said. If that’s Lin GengXin above, it’s a terrible photo. I know it’s been a few years since BBJX but his bridge looks a little crooked (lights/shadows) but his upper lip looks botoxed. or it could be poor photo touchup job. the lighting angle makes for a strange looking nose.